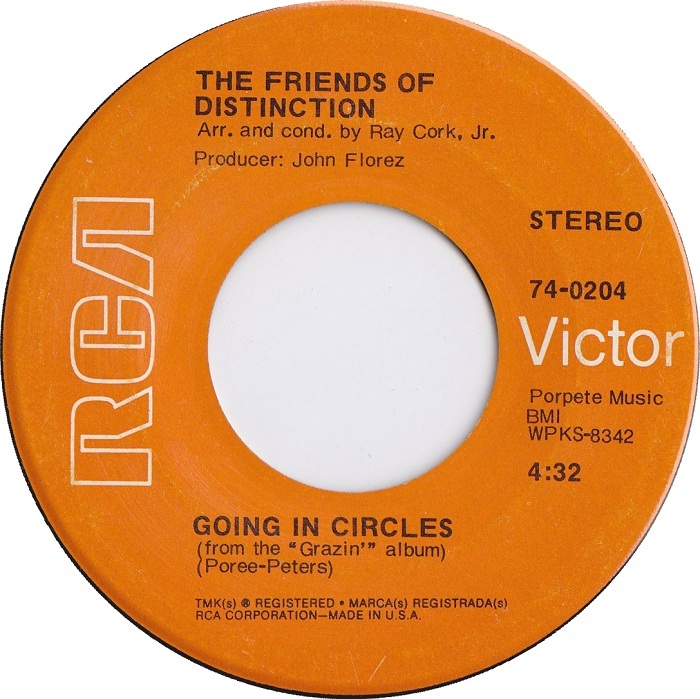 Soul Serenade: The Friends Of Distinction, "Going In Circles"
Out of the ashes of the Hi_Fis rose two classic vocal groups; the 5th Dimension, and the Friends of Distinction. Good old number 32. During his heyday with the Cleveland Browns, Jim Brown was the best running back in the league, and I would argue that he’s still the best that ever was. But what on earth does that his have to do with the world of classic soul music? Read on. The Friends of Distinction were founded by two music industry veterans, Harry Elston and Floyd Butler, in 1966. Elston and Butler had been part of a group called the Hi-Fis, who backed Ray Charles. That group also included two singers named Lamont McLemore and Marilyn McCoo who went on to enormous success with the 5th Dimension. In fact, history records that the original name of the 5th Dimension was the Hi-Fis. That last tidbit is pretty interesting. Although they had a couple of massive hits, most people tend to think of the Friends of Distinction as something of a ripoff of the 5th Dimension. The truth is, if the stars had aligned differently, the Friends of Distinction could have been the 5th Dimension. As it turned out, when McLemore and McCoo left, the Hi-Fis as they were then know disbanded. Elston and Butler took the opportunity to recruit two new singers, Jessica Cleaves, and Barbara Jean Love, and called the new lineup the Friends of Distinction. After touring around LA for awhile in 1968, the group was signed to RCA Records. The following year, they released their first single, and it was a smash. “Grazing in the Grass” was a cover of Hugh Masekela’s instrumental hit of the same name. Elston wrote the lyrics based on the trumpet lead that Masekela played on the original. The record stayed on the charts for 17 weeks, reaching #5 on the R&B chart, and peaking at #3 on the Billboard Hot 100. The follow up was released four months later and was an even bigger seller. “Going In Circles” charted #3 R&B, and #15 Pop, but it stayed on the charts for 19 weeks, sold over a million copies, and gave the Friends of Distinction their second gold record. The beautiful ballad was later covered by soul music luminaries Isaac Hayes, and Luther Vandross. The Friends had three more chart singles, “Love Or Let Me Be Lonely,” “Time Waits For No One,” and “I Need You,” but none of them met with nearly the same success as the group’s first two singles. It was the beginning of the end for the group. Five years after their success of their early releases, and with no more hits on the horizon, Elston and Butler decided to disband the Friends of Distinction in the mid-’70s. Love and Cleaves had long since departed. Cleaves went on to further success with Earth, Wind & Fire, and Parliament. Unfortunately, it was not a peaceful end. The acrimony between Elston and Butler led to a falling out between the two. They didn’t speak for several years, but eventually reconciled. Then Butler died of a heart attack, in Elston’s arms. Before Butler’s death the pair had agreed to reform the Friends of Distinction, and Elston accomplished that when he put the group back together with a new lineup in 1996. And what about Jim Brown? Well as it turns out, the manager of the Friends of Distinction was none other than #32 himself.